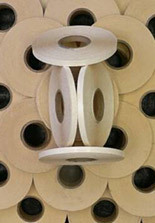 Pocono Coated Products manufactures a variety of materials for many corporations both nationally and internationally. We strive to meet our clients’ needs and always welcome the challenge of new products. Pocono Coated Products, LLC was established in 2004 to assist companies with their Research and Development goals. In today’s global marketplace innovation is necessary to remain competitive. We provide our customers with a knowledgeable expansion to their existing R&D department. Since our inception, we have been challenged by a large number of corporations with an outstanding success rate. Each customer can rest easy in the knowledge that all interactions are considered confidential. Focusing on environmentally responsible approaches to manufacturing is one of our primary objectives. In order to accomplish this goal, we specialize in hot melt and 100% solids technologies which do not release any Volatile Organic Compounds into the atmosphere. Pocono Coated utilizes a comprehensive laboratory to ensure high quality and accuracy in all of our products, including double faced tape and custom coatings. We employ Good Manufacturing Practice for consistency from one production run to the next. So if you are preparing to develop a product, or are interested in one of our product lines, or want to learn more about our manufacturing services, give us a call at (704) 445-7891. Pocono Coated Products has been focused on efficient management and remaining environmentally responsible since its inception in 2004. While efforts have always been to limit and reduce waste during manufacturing we are taking the next step to reuse the material that is left upon completion. Striving to reduce landfill waste we are launching our Reduce- Reuse Program that will decrease waste generated. Our first product in the Reduce-Reuse Program has been double faced tape. Upon completion we had rolls of material that were usable but fell short on specifications (width, length). We want to offer you the material for FREE. All you have to do is pay for shipping and handling! The double coated tape that will be offered for this program has an aggressive adhesive on a polyester carrier, and is available by the case. Suggested uses for this product include, but are not limited to, connecting your material to cores for process and sample/lab trials. Please keep in mind that widths and coating coverage will vary. If you are interested in participating in the program please contact us to be added to the list of recipients.